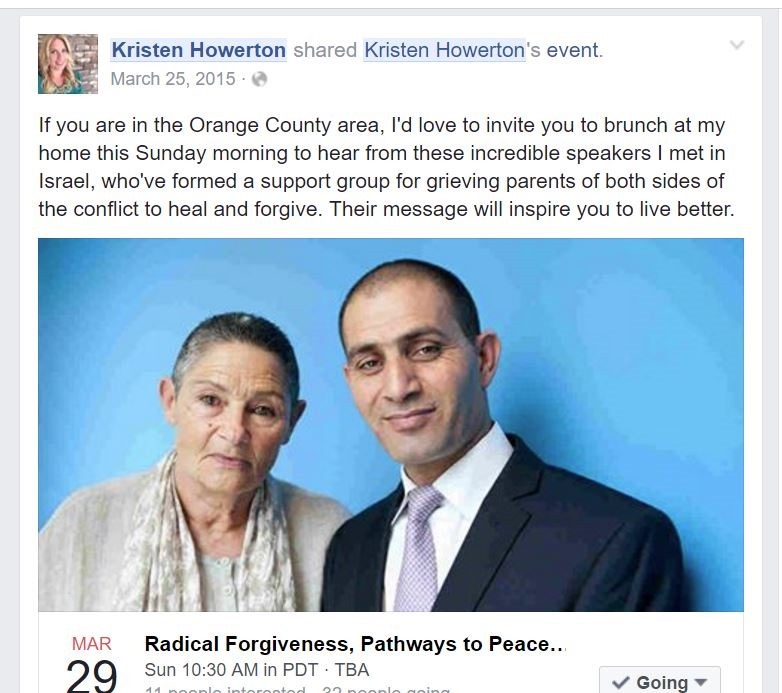 I had no idea who these people were and knew next to nothing about the Israeli-Palestinian conflict or the PC-FF, but it was an OPEN invitation for anyone local to come to Kristen’s HOUSE, to hear these people, and I was “in the Orange County area,” so OF COURSE, I RSVPed. And then, so I wouldn’t come off as the shallow fangirl I was, I started Googling everything about Israel and Palestine. Talk about overwhelm. Fortunately for me, Kristen is a thoughtful writer who surely knows her American audience, and provided a link to the Crash Course in History video about the conflict for those of us who needed a primer. The event was held on a Sunday, and right as we pulled up to Kristen’s house, I wondered aloud if there was a dress code for this kind of thing. Of course, if there was, it was too late for me. I was in standard “Vacation With Kids” attire: jeans, sneakers, and T shirt. 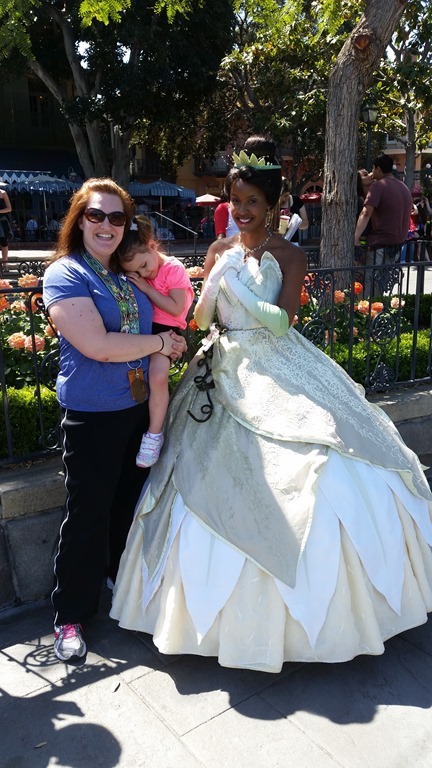 Rockin’ the vacay threads with Neenie and Princess Tiana at Disneyland. Clearly I am in the Comfort over Style camp. Yeah…..no. I mumbled a thank you and ducked inside. Aaaannd, of course, the house was full of willowy, gorgeous women with flowing, sun-kissed hair and skin, all wearing breezy maxi-dresses, dangly earrings, and tall sandals. Dress code analysis: Everyone looked like they’d just come in from a beach photo shoot for Vogue. And here I am in mom jeans and scuffed Nikes. Was I even wearing earrings? I checked. No. But…whatever! I was IN Kristen Howerton’s house and now I would get to MEET HER! SQUEEE! I mean—ahem–what an opportunity to broaden my education and worldview about the Israeli-Palestinian conflict! I saw Kristen in her kitchen, deep in conversation with three or four other people, and suddenly I realized just how out of place I was—these gorgeous women chatting and drinking mimosas were Kristen’s friends, or friends of friends. I was a hayseed interloper! I had introduced myself to Kristen in my head a hundred times, but now I panicked. I couldn’t waltz over and interrupt her conversation—that would be awkward. Do I try to catch her eye and hope she comes over and introduces herself? Um….no. Too stalkerish. Now what? I wandered into the living room, which I knew pretty well, having seen various angles of it in photos on Kristen’s blog over the years. Do I sit down? No, no one else is. I might look like I’m getting too comfortable. I could admire the decor….no, now I feel like I’m casing the joint. Do I try to make nice with some of the other clusters of ladies? How do I do that? Do I go get some food? What’s IN a mimosa? Just then, Kristen’s husband breezed past me, headed for the back yard, where there were a few rows of folding chairs set up. The chairs were in direct sun, and Mark was fiddling with some triangular awnings to provide shade. Salvation! I’m a pro at setting up for events! I stumbled outside to see if I could help, but Mark winged me a smile and said he had a handle on it. A couple of ladies followed me outside and made directly for the mimosa table set up on the side of the patio. They noticed me bumbling around and kindly introduced themselves. They seemed genuinely interested in me (maybe they were just morbidly curious) but I was too tongue tied and awkward to provide them with much information—so I did the only thing I could think of—I deflected and tried to ask them about themselves. They were both bloggers and authors, I realized I recognized them–I had read some of their stuff and enjoyed it. I was about to say so, but then Kristen came out and they turned their attention to her. By now, other people had filtered outside and were taking (now shaded) seats. For some stupid reason, I dove for the seat closest to me—at the end of the front row—where the sun beat down between the gap in the awnings. The other seats were filling up, and there were a couple offers from nice ladies to have me sit by them in the shade, but Mark kneeled on the ground in the walkway just behind me, adjusting a camera on a tripod, and I was afraid I’d bump it if I moved. Turns out he was adjusting it because I was in the way. By the time I realized this, it was too late to move—all the seats were filled. Awesome. Whether it was the sun or my embarrassment that burnt my face that day, I’ll never know for sure. When everyone had settled, Kristen introduced her guest speakers and for a millisecond, my embarrassment evaporated. Robi Damelin was direct, passionate, a little impatient, and fascinating. She was like a grandma that you love but are also a little afraid of. And I could not get over how much she reminded me of Judi Dench. She thanked Kristen for the introduction and then insisted everyone assembled introduce themselves and tell why they had come, and what they hoped to gain from the meeting. This wasn’t good enough for Robi Damelin. She asked me a follow up question, but it escapes me now, what she asked—and what I responded, but her message was clear. I mattered. She wanted to know more about me. I fumbled through an answer…gosh, I wish I could remember what she asked me. It was probably something very basic, but more than anything, I realized that I was NOT going to be anonymous in this little group. No, no. Robi Damelin don’t play. She saw me. She heard me. And she expected me to interact. I felt both chastised and anointed. We were going to have a DISCUSSION that day! Several answers were offered before Robi Damelin told us what it means to her. She said the definition of forgiveness that most resonates with her is “giving up your just right to revenge.” Robi Damelin’s son David was serving in the Israeli army reserves when he was shot and killed by a Palestinian sniper. Robi Damelin has every right to demand vengeance, but instead, seeks ways to reconcile with the people who have brought her only pain and loss. No description of mine can thoroughly capture Robi Damelin’s words or presence at the meeting at Kristen’s house, but I found the following video in which she shares her story and her thoughts on forgiveness and the reconciliation organization she works with, The Parent’s Circle—Family Forum, a group of some 600 Israeli and Palestinian families who have lost an immediate family member in the Israeli-Palestinian conflict. Please watch it and be changed. Much like in this video, Robi Damelin talked at Kristen’s house about forgiveness, about her son, and about how violence will never truly reconcile anything. She spoke of the Parents Circle-Family Forum and their work to help people see the human side of the conflict and find ways to come to peace. There are no answers yet, and there are big feelings on both sides, which Bassam Aramin, the other speaker at Kristen’s heartily affirmed, but there will NEVER be answers if people on either side of the conflict remain bent on destroying each other. After Robi Damelin spoke Bassam Aramin got up to speak. He is younger than Robi Damelin and more soft spoken, but Bassam told his story with a simmering passion. His voice was quiet and matter-of-fact, but his pain was palpable and our tears fell. He told how he, a Palestinian, was raised to hate Israelis because they stole his homeland from his ancestors. He was arrested at age 17 for throwing stones and a grenade at Israeli tanks, and was jailed, beaten, and broken for seven years. He still suffers from the effects of the torture he endured. He spoke of his years in jail, his hatred and anger, and his desire for revenge. He told us how over time he and one of the Israeli guards befriended one another and he began to realize that their pain and anger was the same, their stories and their fears were so similar. He realized that violence only begets more violence and that only understanding another’s humanity is the only effective way to resolve conflict. He never picked up a weapon again, even years later when his 12 year old daughter was killed outside her school by an Israeli soldier. More than once, Robi Damelin took Bassam’s hand to steady him as he talked about his daughter and how much he missed her, how senseless was her murder. Witnessing the love and compassion between these two bereaved friends, I can only describe it as powerful and sacred. Their power is in their pain and they work tirelessly for peace and understanding. Reconciliation. Beauty for ashes. This video shows Bassam and Robi Damelin together. You can just feel their passion for their work, and their love and friendship for each other. When they finished speaking, we were invited to ask questions, but there weren’t many. Several ladies admitted they didn’t know much about the conflict and were inspired to learn more and to do what they could with their social and educational platforms to share more about the Parents Circle-Family Forum. All I could do is wonder that my shallow, self-centered desire to rub elbows with my favorite blogger had led me to a deeper, more profound experience of shared humanity. I knew I had just participated in something huge for me and I would need to process it for a while. I sat for some time by myself, after the talks were over and people returned to socializing. Bassam disappeared inside and Robi Damelin was immediately surrounded by women wanting to talk to her. I wanted to throw my arms around her and hug her and tell her thank you. I wanted to find Bassam and do the same, but I didn’t. Instead, I sat and thought. I was only roused to move when one of the ladies asked for a group picture with everyone in attendance. I wish I’d asked for a copy of the photo, but I don’t even remember who took it. After the photo, Kristen invited anyone who wanted to, to come to her church, where Robi Damelin and Bassam were going to speak in an hour. The guest speakers were driven away to the church and the rest of us stood around chatting and finishing up the brunch offerings for a few more minutes. I fell in with a couple of women who were discussing religion and because my mind was still on Robi Damelin and Bassam’s words, I was more awkward than usual and didn’t contribute anything worthwhile. Eventually, it was time for everyone to leave, as Kristen had to head down to the church. She and the last few of her friends who had stayed to socialize, started closing things up. I still hadn’t MET Kristen formally, and for some reason, it felt inappropriate to march up and introduce myself to her as she flurried around closing drapes and putting food away. I needed to get gone so she could move on to other things. I was starting to panic again, because I needed to be out of her house, but Julio hadn’t yet arrived to pick me up, even though I had texted him while I was still sitting and pondering my experience. After lurking in Kristen’s entry for an eternity, waiting for Julio, I decided I’d better just leave so Kristen and her friends could get to church. I called out a thank you to Kristen and bolted outside, trying to decide which way I should wander in the neighborhood until Julio showed up. I nearly ran over a couple of Kristen’s kids, who had set up a lemonade stand in the front yard. I didn’t even have 50 cents to buy a cup. They were not impressed. Fortunately, Julio pulled up then and I jumped in like it was a get-away car and I had just robbed a bank. So, it’s taken me well over a year to be able to write about this experience. I’ll admit, one reason for this is because I’m embarrassed to admit I’m such an awkward fangirl and was totally willing to essentially be a stalker. When I RSVPed to Kristen’s event, I had zero REAL interest in WHY she was hosting it. I just wanted to meet my hero and walk around in her world for a little while. But my experience with Robi Damelin and Bassam Aramin transcended my petty little dream of hobnobbing with my favorite blogger. I got to share in the very human, very sacred stories of these brave and determined people and I don’t take that lightly. I have spent the last year thinking on their stories and their words. I have tried to become more of a facilitator of peace and understanding in my own life and in my daily interactions. I’m not perfect and there are some reconciliations I am still not ready for, but I think often of Robie Damelin and Bassam Aramin, and I hope someday I can see the world like they see it, with an eye always towards reconciliation, understanding, and peace. That’s better than living a fangirl dream, any day.